This is my first Models Own Nail Polish. I was by Mall of America (Minnesota) at a conference for work and I consider it a sin not to go to MOA when you are 15 minutes from it. Anyway...I was wandering around Urban Outfitters, minding my own business, when I saw Models Own nail polish. I was surprised because I always thought Models Own was only available in the UK?? It looked like they had the whole Beetle Juice Collection, but I decided to narrow my choice to 1 and it was a no-brainer that I would get the purple/blue one called "Aqua Violet"
This was one of the hardest nail polishes for me to photograph so far. This was harder than China Glaze Flip Flop Fantasy...and that was hard! Hopefully you can see how the color shifts from blue to purple. I'm sure there are better swatches out there, but this was my best effort. So was the MOA mindblowingly huge? And saWEET that these are finally stateside I wonder if they've made it to the west coast yet.... will have to explore this. Aqua Violet looks gorgeous on you. Yes, MOA is huge, but I go there quite a bit since it's only like 1.5 hours away, so now that I more familiar with where everything is, it doesn't seem as big. But yes, it's big:) I wonder if Models Own will be anywhere else besides Urban Outfitters. Do you have an Urban Outfitters anywhere near you? Colors like this are SO hard to photograph. 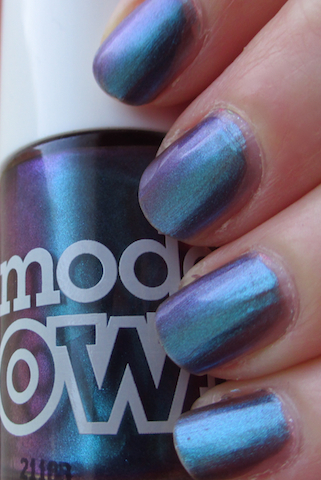 I had the same problem with Wet N' Wild Gray's Anatomy which has a similar holo finish.